Oppdag Marrakeshs frodige oase fra toppen av en kamel på denne solnedgangskamelturen gjennom Palmeraie, en stor palmehytte en kort kjøretur fra byen. Etter å ha blitt plukket opp på Marrakech-hotellet, går du til Palmeraie for din naturskjønne kamelturopplevelse, så besøker du et berberhus og har mat og mintete. La kjas og mas i Marrakech ligge og bli hentet fra hotellet eller møtestedet (hvis du bor i medinaen) for å gå på et solnedgangskamelturopplevende eventyr. 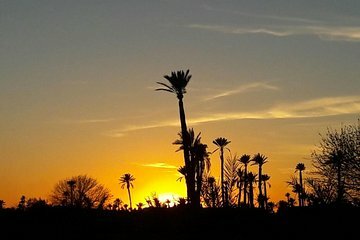 Gå til Palmeraie, en pittoresk palmerlund på kanten av byen, for din naturskjønne kamelturopplevelse, bli vist til kamel og lær hvordan disse hardy øredyrene har blitt brukt til transport i Marokko i århundrer takket være deres evne til å reise lange avstander uten vann. Etter en sikkerhetsopplysning, bruk din Nomad-kjole med sheshen (turbanen) og klatre inn i salen på baksiden av en kamel, og slapp av mens du er på tur gjennom de grønne håndflatene. Etter 30 min kjøretur stopper du for å besøke et berberhus for å oppdage lokalbefolkningenes virkelige liv, er dette her hvor du kan nyte mat og mintete med familien, etter at du tar kamel igjen for å fortsette turen, ta kameraet ditt ut for å ta noen bilder av den vakre solnedgangen som himmelen forandrer farger gjennom trærne. Når turen er fullført, vil du reise tilbake til din innkvartering. The trip is only one hour of riding, half hour of tea and half hour of transfer. Kids charged full price but have to share a camel. Guide was great but not much to work with as walking area pretty boring. Berber stop is ok.
Great experience especially if you have never been on a camel. Tour was very well organized and our guide driver/guide Avil was great. Hicham Lamkehouane, our guide was fabulous, we all got onto the camels and laughed and sang. Hicham made us all camel rings. The camels were well cared for and well fed. We loved the Berber House.. the fresh bread and olives were delicious. We all really enjoyed ourselves. One of the girls got frightened and Hicham was so kind to her. It was a fabulous trip and We would recommend it to anyone. Great driver, great guide, great host for Berber family visit, and perfect sunset. This trip was well worth the time and expense. We had a great time! The guides were very knowledgeable, funny, and took GREAT photos. At the end we were invited for tea and snacks in a Berber tent. This was a great experience but found it too long on the camel. Wasn't expecting to be tethered to the other camels and found this a little disappointing as we just walked for about an hour in a train through an 'oasis'. Did it for a birthday experience and will not forget it but not sure I'd do this trip again if I'm honest. The berber house was an experience but left me puzzled as was given conflicting local knowledge than on a previous experience. The host of the Berber house tea and bread visit was very hospitable and friendly. Tour guide was friendly. Was a group of 7. Great experience with wonderful pics of the sunset and moon rising in the background. Our berber guide, Souffian, provided us with a 5 star professional and courteous treatment. Spoke great english, handled the camels very well and stayed behind the six-camel group while the assistant led the group. Other groups that crossed with ours had both handlers in front. Great interaction with a berber family at their home while enjoying mint tea and olive oil. Picked up in a comfortable van at the exact time agreed upon. Definite recommendation; you will enjoy it!! The whole experience was wonderful. Someone reached out a couple days in advance via email and WhatsApp to let us know what time they'd be by to pick us up. We were picked up from our hotel promptly at the specified time. The driver was very friendly, referring to us by our names, and very knowledgeable. He filled us in on interesting tidbits about the city during our car ride. The camel ride itself was a lovely experience. I think that one hour is the perfect length of time. The sunset was beautiful and lasted quite a while. 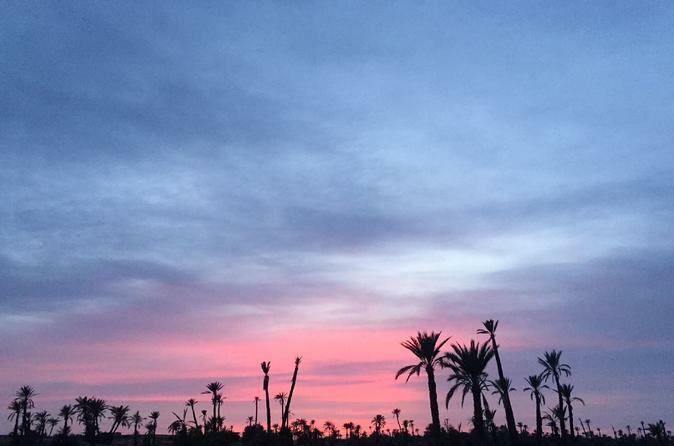 The silhouette of palm trees against the painted sky made for plenty of picturesque photos. The guides were witty and conversational and kept the whole tour group laughing nonstop. They also offered to take plenty of photos and videos of us on the camels. Finally, we had mint tea, bread, and olives at a Berber house. Our host was kind, refilling our glasses as soon as they were empty and bringing out a plate piled high with homemade biscuits. Afterwards, we were dropped back to our hotel. Honestly a wonderful little adventure! Our guide during the pick-up, Jamal, was extremely friendly, conversant, knowledgeable. Our guides while on the camels, Yousif and Ali, gave clear directions for mounting, assisted with photos and made the process extremely easy. Their conversations during the trip was entertaining and the group interaction was fantastic. The night was nicely finished at a Berber home with the comforts of mint tea, bread, olive oil and olives.